If you play Minecraft, you'll know that it is an independent nation of block engineers, and its colors should be worn with pride. 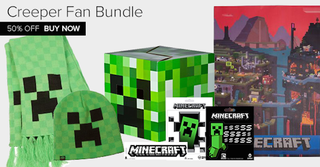 This 7-piece bundle of Biome-themed swag will give you the look, and for a little while it's 50% off for Kotaku readers. Shipping is free, but it's is only available to the Continental US. If you'd like to add the plush toy, make sure to select that option on the product page. For more details and to grab the deal, have a look at the link.